April showers bring May flowers. 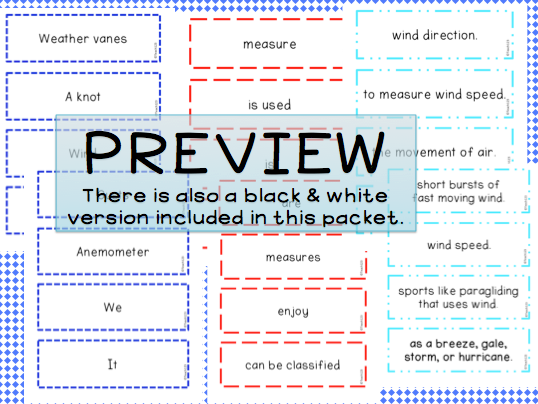 What better time to study weather than when our weather is changing with the new season! 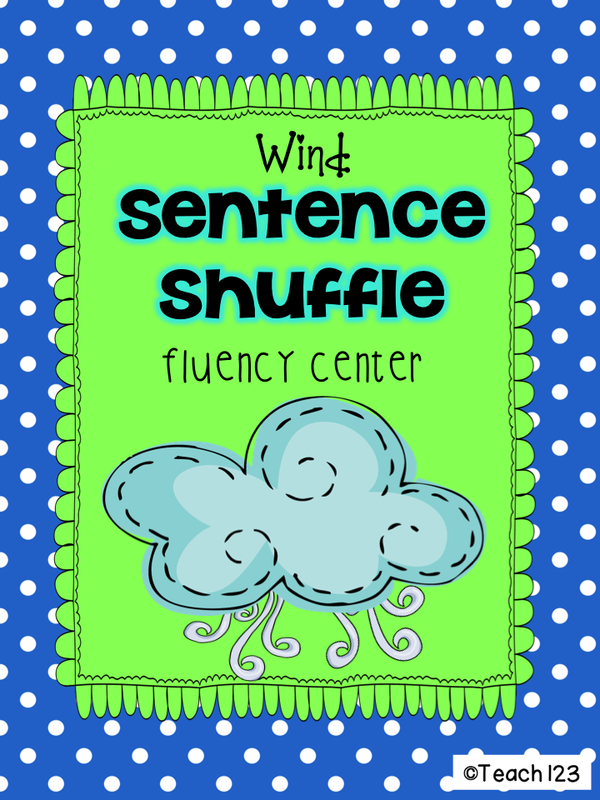 I have made two weather fluency centers. One is on the 2nd grade reading level (2.1) and the second one is on the 5th grade reading level (5.4). This can be set up as a center or a folder game. 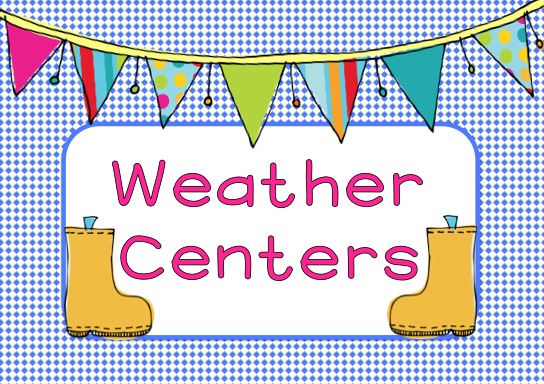 Click HERE for ideas for setting it up as a center. 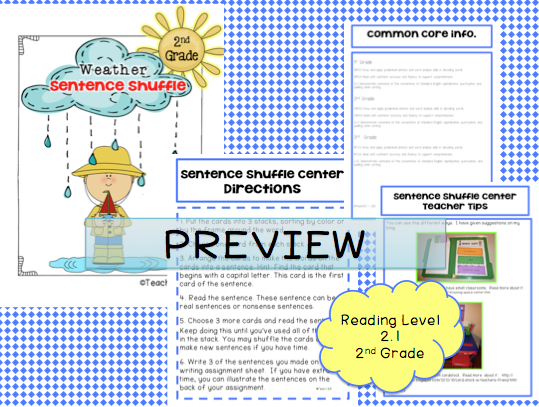 Click HERE for ideas for setting it up as a folder game. This post also has a free printable for you. 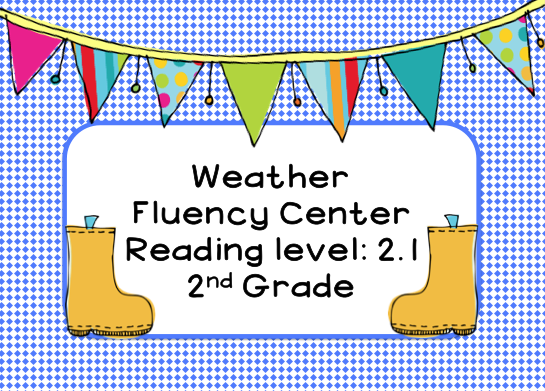 This center is aligned with 1st, 2nd, and 3rd grade Common Core Standards. Included in this packet is a center sign with a white background which is ink friendly. Hang the directions sign in your center in case your students don’t listen when you explain the directions the first time. They now have a handy reference tool instead of interrupting your lesson. I include pictures from the 2 posts above. Students shuffle the cards and sort them into piles. 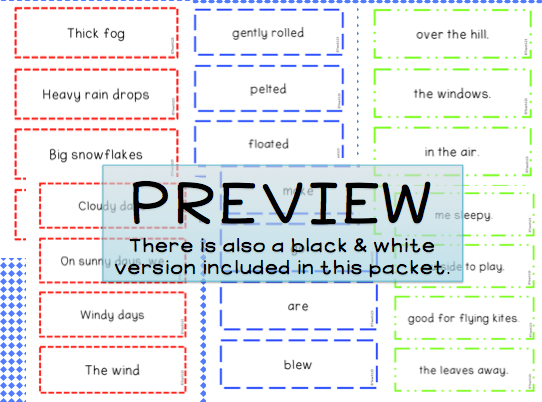 They will sort by color in the colored version of the game and sort by pattern of the frame around the phrases in the black and white version. If you want to make this center colorful but don’t want to spend extra money on ink, copy it on colored paper or card stock. Students will put the cards on the sorting sheet. There is a colorful sorting sheet and black & white sorting sheet. 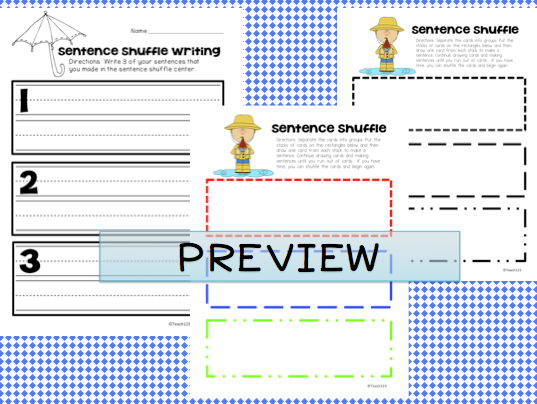 After students finish making and reading sentences, they will choose 3 of their sentences to write on the page above. 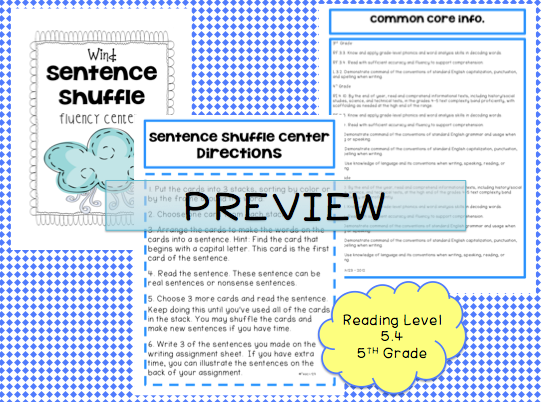 After students choose one card from each stack of cards that is on the sorting page, they will put the cards in the correct order to make a sentence. Then they will read their sentence to their partner. Then it is their partner’s turn. Students continue making real and/or nonsense sentences until they run out of cards. 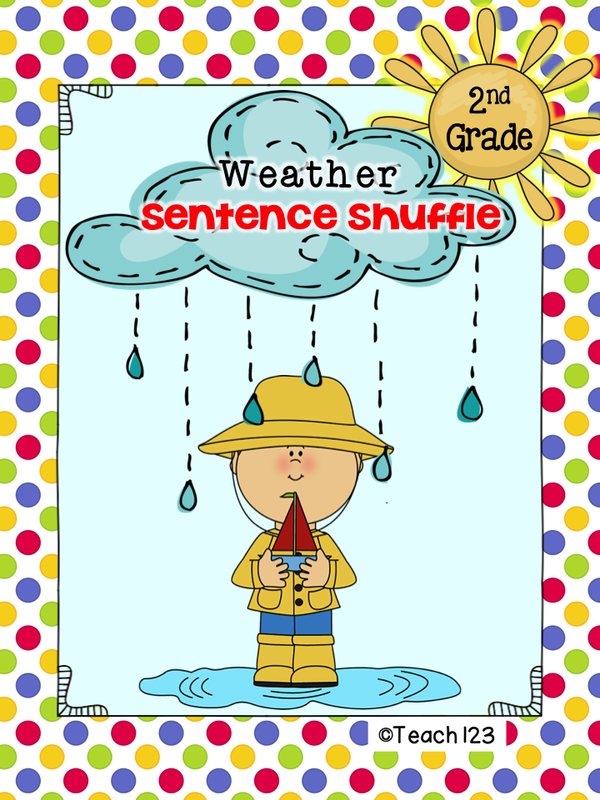 They can either shuffle the cards and make more sentences or complete the writing assignment. 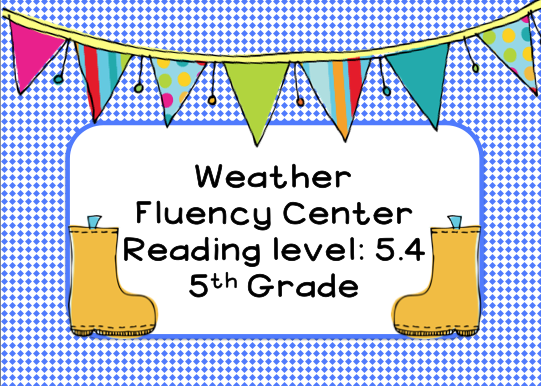 This center is aligned with 3rd, 4th, and 5th grade Common Core Standards. Included in this packet is a center sign with a white background which is ink friendly. Hang the directions sign in your center in case your students don’t listen when you explain the directions the first time. They now have a handy reference tool instead of interrupting your lesson. Students shuffle the cards and sort them into piles. They will sort by color in the colored version of the game and sort by pattern of the frame around the phrases in the black and white version. If you want to make this center colorful but don’t want to spend extra money on ink, copy it on colored paper or card stock. Students will put the cards on the sorting sheet. There is a colorful sorting sheet and black & white sorting sheet. 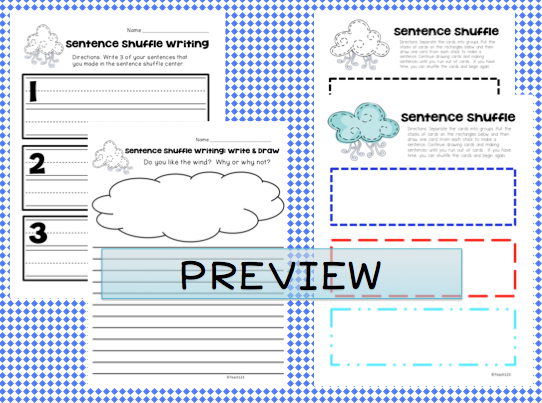 After students finish making and reading sentences, they will choose 3 of their sentences to write on the page above or there is a writing prompt page that they can complete. I included two writing assignments so you can differentiate. Would you like to treat yourself? What better way than with shoes . . . OK in this case it is rain boots! Since I live in the San Francisco bay area, I would have plenty of rain days to use them. Have you been looking for some rain boots? Here are a couple of cute ones I found. My favorite sentence of your post? "Hang the directions sign in your center in case your students don't listen when you explain the directions the first time." Love it!